The fires that swept the North Bay earlier this month left behind a swath of destruction: at least 5,700 homes and buildings were destroyed and most significantly, at least 42 people have died, with 27 others still unaccounted for as of Wednesday. Many people in the region have lost their homes, their place of employment or have been significantly impacted by the fires in some way. 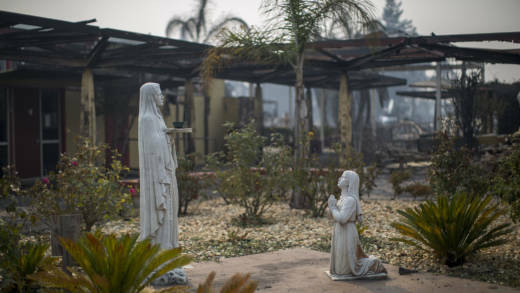 In this hour we'll talk with faith leaders from Sonoma County about how their religions or practices are helping their communities get through the challenges and emotions brought on by the historic wildfires. If your faith is helping you cope in the wake of the North Bay fires, please tell us how. And if you're not active in a religious or spiritual practice, where are you finding solace?